Local investors took their cue from Wall Street yesterday and played it safe after the United States Federal Reserve hiked interest rates for the fourth time this year. The Straits Times Index was down by 0.56 per cent in morning trade but pared losses to close 8.03 points, or 0.26 per cent, lower at 3,050.62. Investors had hoped for a softer approach from the Fed amid a host of issues, from US-China trade to a slowing Chinese economy, weighing on global growth prospects. The Fed did trim the number of possible rate hikes projected next year from three to two, but markets had been priced for just one increase. Mr Ray Attrill, a strategist at National Australia Bank, told Bloomberg that the post-Fed meeting sentiment was "a bit surprising" given the bank had stressed a "gradual" pace of rate hikes next year. IG strategist Pan Jingyi said: "Not only did we not get the Santa rally that was hoped for, it does look like one has to grow more accustomed to the market joining President (Donald) Trump in viewing the Fed as an 'enemy of the people'." Losers outnumbered gainers here 281 to 125 with about 1.21 billion shares worth $869.8 million changing hands. Actively traded counters included Ezion Holdings, which fell 6.38 per cent to 4.4 cents with 46.6 million shares changing hands, and Golden Agri-Resources, down 2 per cent to 24.5 cents on trade of 36.4 million. Banks weighed on the index with DBS Group Holdings dipping 0.72 per cent to $23.40, while United Overseas Bank lost 0.21 per cent to $24.31 and OCBC Bank pared 0.54 per cent to $11.08. 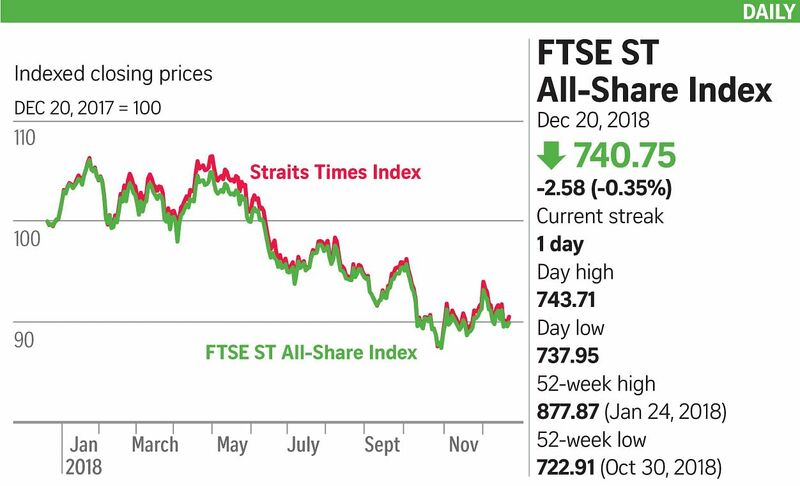 Singapore Reits, perceived as defensive plays by analysts, also ended in the red, with rising interest rates acting as dampeners. Mapletree North Asia Commercial Trust closed 0.86 per cent lower at $1.15 and Frasers Centrepoint Trust declined 0.46 per cent to $2.17. The standout was Frasers Logistics & Industrial Trust, up 0.95 per cent to $1.06. Spillover from the rate hike weighed on Asian stocks too, with the Sydney and Tokyo benchmarks slumping to new lows. The Australian ASX 200 index dropped 1.3 per cent to end at its lowest in two years. Similarly, the Nikkei index sank to a 15-month low after diving 2.84 per cent. China's central bank kept short-term borrowing rates unchanged but failed to lift spirits. Shanghai fell 0.52 per cent while Hong Kong lost 0.94 per cent.